Pink slime is a slang term for what the meat packing industry calls 'lean beef trimmings' or 'lean finely textured beef'. The term Pink Slime was originally coined by Gerald Zirnstein, a food inspector and whistle blower who has been working since 2002 to raise public awareness of pink slime and its prolific use. 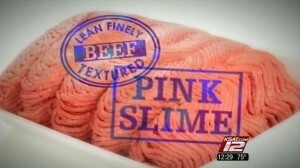 Pink slime is processed from beef trimmings. IE: All the 'leftovers' after butchering. Those leftovers are then warmed, centrifuged and treated with ammonium hydroxide gas to kill off bacteria. At this point its is considered 'editable' and 'acceptable' under current federal health standards. Then it is compressed into blocks and frozen. Let's clarify what beef trimmings are. They are 'edible' parts of the cow that include: connective tissue, tail, snout, hoof flesh and internal organs too inappropriate to mention. They need to be sanitized for consumption, because they may contain E.coli and salmonella.